Join Candace as she reflects on the self-discovery that came through leaping out of her comfort zone. Go behind the scenes and experience the highs and lows, the roadblocks, and the personal victories. Hear straight from her heart on tough lessons learned about grace, rejection, perfectionism, disappointment, accountability, dealing with criticism, and more. Through God's strength, and with the help of endless support from her family and friends, see how Candace stayed true to herself and publicly lived out her faith in Christ all the way to the finale. If you buy one book this entire year, buy Dancing Through Life, and this purchase is one you won't regret. 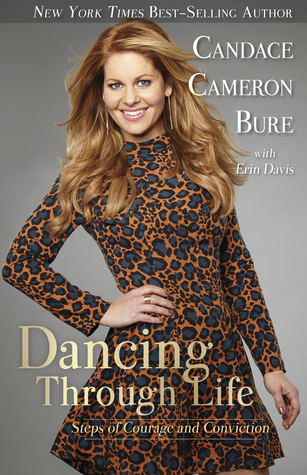 Having read it in one sitting, I was amazed at the strength, courage and endurance Candance faced not only through her time with DWTS (Dancing with the Stars), but what she encounters in life with the thoughts of millions of people. In Dancing Through Life, we get a glimpse of the grueling training Bure goes through as she learns the routines of the different dances, behind the scenes, the live events and the emotional roller coaster of her journey through Season 18 of DWTS. More than just about dancing, this book encompasses Bure's faith, which is evident in everything she does, the words she speaks and the costumes she chooses for each performance. Off television, Candace talks about her struggles as a mother. During this season of her life, she was top notch career wise, but that meant making sacrifices on the home front, which included moments with her kids. She specifically talked about an incident in the book with her daughter, Natasha. I love how the candidate and honest, Bure is about her struggles, emotions and faith during this season of her life because it brings genuine authenticity to who she is a mother, Jesus follower, actress, wife, and woman. During DWTS, it was difficult for Candace to juggle all of these areas, but she learned how to manage where she could. I love how she talked about during the day for the live show of DWTS, she would be sitting to get her hair done and she would pull out her Bible to read or how she would minister to people in small ways to God. She is an example of living out the Great Commission with a solid faith. Dancing Through Life is a book filled with Biblical truths that will leave you inspired and more passionate about the Lord after reading it. You will look at Candace entirely different and know that everything she does is prayerfully considered. She and her family genuine live out their faith and practice what they preach, which is something very rare to find. I love how real she is and how she uses examples from the Bible to go alongside the struggles she was facing in life. Thank you to B&H Publishing for providing me a complimentary copy for review. I was provided a copy for my honest opinion, which I have given. To Purchase a Copy, pick it up here, which I highly recommend!!! This is a great winter read that you don't want to miss, especially if you're a DWTS fan or a Candace fan!